Every month we all have the same kind of withdrawals from our bank accounts. Everything from our mortgage to the food we eat. We make our budgets, we live according to what we can afford and we know that every month, the money that we earn is going to home us, feed us, clothe us. As someone living in the UK I have many privileges. I know that I am safe; both in the house I live in and the country I reside in. Neither will be taken away from me. I have food, water, sanitation. Something as simple as turning on a tap or flushing a toilet is something that I will never need to worry about. This is why, the most important withdrawals from my account each month are my charity donations. For people who do not have those basic things such as a safe roof over their head, food, water, sanitation. I cannot give a lot, but every penny really does count. 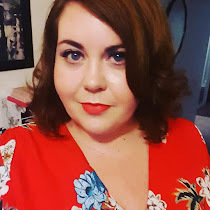 I was recently contacted by Oxfam and asked if I would help with their campaign to share stories of hope. Stories of people who do not have the things that we take for granted every day. People that have faced adversity every day of their lives, yet still have managed to make a life and provide for their families. So today, I wanted to tell you about Buchumi. Buchumi was born in Burundi. Due to fighting and unrest in Burundi, Buchumi and people like him have been forced to seek refuge in Tanzania. Buchumi has been living in refugee camps since 1999. Think about that. That is 17 years of not having a proper home. After moving into his first refugee camp, he met his wife a few years later. In 2010 they moved into a new camp and went on to have four children. Due to a lack of food and small portions, Buchumi needed to support his family and find a way of making an income. 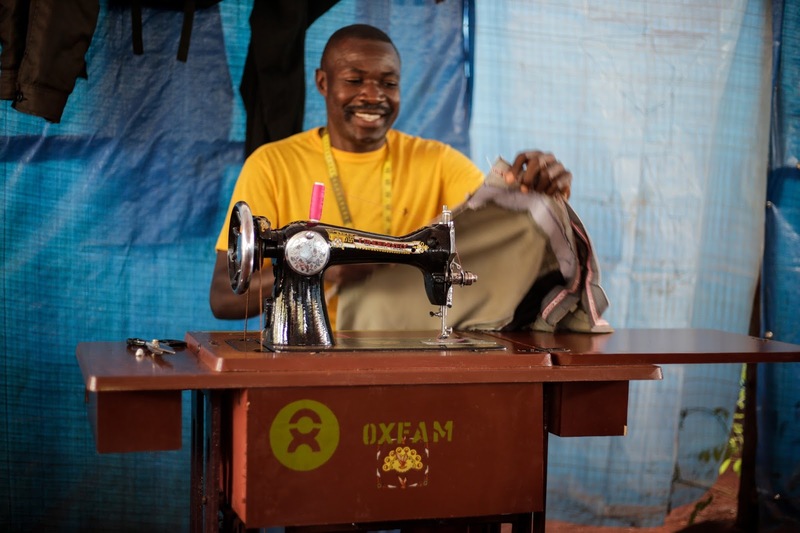 Previously a teacher, but with the schools closed down, he decided to take up tailoring lessons to learn how to sew. 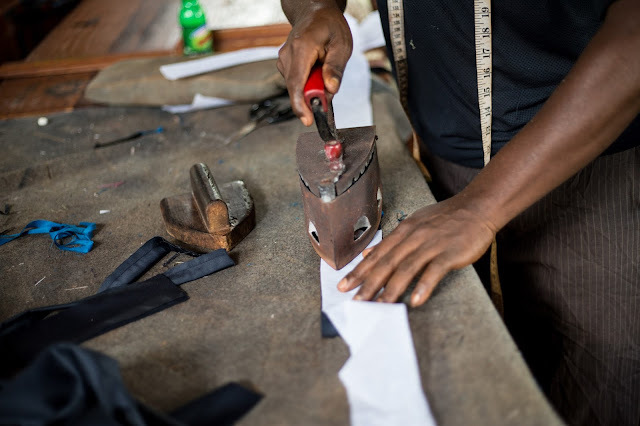 With the income that he makes from being a tailor, he is now able to provide food for his family. He is making the best out of a horrible situation and is providing a future for his family. Due to the influx of people coming into camps in places that were only sparsely populated before, this has meant the Nyarugusu refugee camp, that was originally set up for Congolese refugees, has quickly run out of space. Three new camps have been set up but each need sanitation improvements and emergency supplies. Oxfam is working in Nyarugusu and Nduta, one of the new camps, to provide water and sanitation facilities, emergency food, and support to access work. 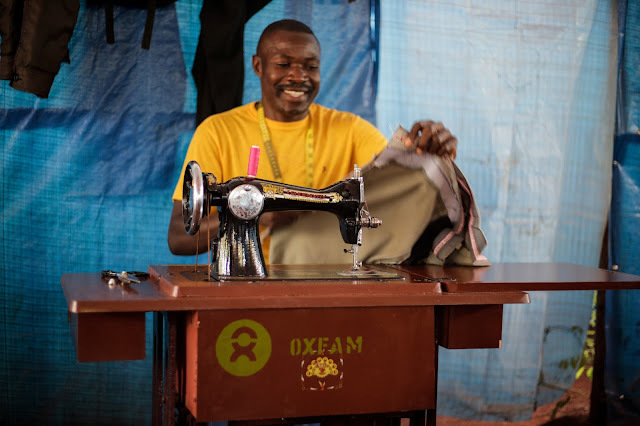 Providing a safe and sanitary environment is a major priority in the work Oxfam has carried out, but helping people improve camp infrastructure and gain new skills is also a high priority. These programmes help refugees like Buchumi create an income and gain stability in their lives. This is why it is so important that we make a donation A single donation of £25 could provide safe water for 25 people. A monthly donation of just £5 could pay for a goat for a family. £20 could pay for two toilets. In just 15 years extreme poverty has been halved. Imagine what the next 15 years could achieve. With every donation, that time frame will lesson. We won't live with poverty.